Hold the date for our 2019 summer action day! This event is under development. To make sure you’re kept up to date about it, sign up to our mailing list. You can read about our previous action days, including Demand Democracy Day and the People’s Lobby for PR, on our blog. We’re delighted to be convening the 2018 Democracy Awards in Parliament, hosted by Tommy Sheppard MP. The Democracy Awards presents us an opportunity to recognise and honour committed activists fighting to introduce Proportional Representation for the House of Commons. Descend on Westminster to lobby for PR! Oxford University Labour Club and Oxford Fabians debate Proportional Representation. Voting Reform: Will Proportional Representation Be In The Labour Manifesto? Join us at the Labour Party conference for a rally and drinks reception aimed at pushing for Labour to back Proportional Representation. A workshop for all Labour members wanting to learn how to push for the Labour Party to support Proportional Representation. #FairVotesFestival brings together people and politicians from across the political spectrum to help create a democracy fit for the 21st Century and a Parliament elected by Proportional Representation. Come along and join the Make Votes Matter contingent on the NHS at 70 demonstration. The government wants you to celebrate the state of British democracy. Instead, take part in Demand Democracy Day on 30th June to call for Proportional Representation and real democracy! After Brexit: What Future Democracy for England? Make Votes Matter co-founder and co-facilitator Klina Jordan will address the issues of democracy and accountability in England in the wake of the Brexit referendum at this event in Malmesbury, Wiltshire. A line-up of eight other speakers will join Klina at the event on Saturday 9th June. They include representatives of some Alliance organisations. See the official website for full details. Buy tickets here for £5 each. Join us at the Welsh Labour Conference in Llandudno for this special event co-hosted with the Labour Campaign for Electoral Reform. You will need a conference pass in order to attend! Make Votes Matter and the Labour Campaign for Electoral Reform present this special fringe event at the Labour North Regional Conference. Join a great line up of speakers for an interactive discussion about the UK's democratic system, and how electoral reform can and must be key pledge of Labour's next manifesto. Pick up a free copy of MVM & LCER's joint report on entry! Join Make Votes Matter & the Labour Campaign for Electoral Reform for this Scottish Labour fringe event to discuss Proportional Representation for Westminster. Make Votes Matter South West London and Compass are bringing together Labour Party members, supporters and others on the political 'left' from west and south west London to discuss the best path to win Proportional Representation. Join us to hear speakers from across the Labour Party and share your views on the way forward. A recent report jointly written by Labour Campaign for Electoral Reform and Make Votes Matter will be available or can be downloaded online: The Many Not The Few: Proportional Representation & Labour in the 21st Century (PDF). Visit us outside Sheffield Town Hall to support our Hungry for Democracy North vigil. The vigil will be kept throughout the day - drop by to say hello or come for as long as you can. Our Westminster vigil will be kept throughout the day. Join us or drop by to show your support! Action Day & Christmas Party! This year we're sending a special Christmas card to Jeremy Corbyn, asking him to support Proportional Representation. By presenting the Labour Leader with a card signed by thousands of voters, we can put PR on his agenda as we move into 2018. The people every MP really has to listen to are their own constituents. That's why we're holding an Action Day in Jeremy Corbyn's Islington North constituency to sign up as many local voters to the Christmas card as we can. Join us on this festive Saturday afternoon of campaigning to help run one of our street stalls placed across the constituency. No experience or expertise is necessary - it will be a fun way to get a taste for campaigning for fair votes! All you need to do is sign up below and turn up at Holloway Road underground station at midday. Look for the Make Votes Matter t-shirts! Thank you! We'll be in touch with further details for the day. 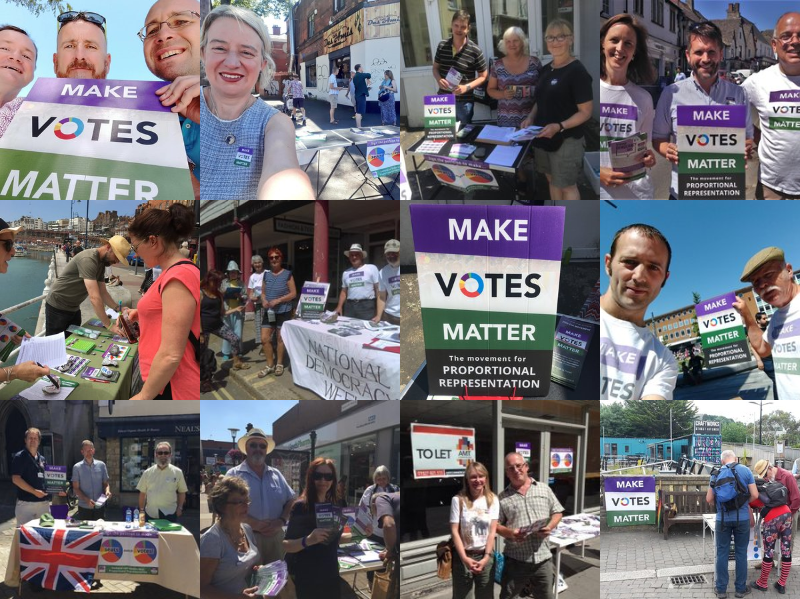 Please contact local@makevotesmatter.org.uk if you have any questions in the meantime. If you can't get to London but are keen to be involved, we'd be happy to support action where you live - just get in touch. Click here to download a sign-up sheet you can print off, ask people to sign and send to us for addition to the Christmas card. Immediately after the Action Day, we're holding the Make Votes Matter Christmas Party at nearby Hargrave Hall (see map below), with drinks and nibbles provided. Local group activists and members of our national team will be there to share their experiences from the year and campaign plans for 2018. Hope you can join us! Labour Party members are invited to join us for this fringe event, co-hosted with the Labour Campaign for Electoral Reform. You will need a conference pass to attend. See conference programme for the room listing. Labour Party members are invited to join us for this fringe event, co-hosted with the Labour Campaign for Electoral Reform. Speakers will include Margaret Greenwood MP, Stephen Twigg MP, Julie Ward MEP and Joe Sousek (LCER & MVM). Chaired by Mary Southcott (LCER). You will need a conference pass to attend. See conference programme for the room listing. We will also be running an exhibition stand for the duration of the conference. On Monday 30th October, Parliament will debate whether to make votes matter. This is the result of our petition for Proportional Representation, thanks to the hard work of dozens of parties and organisations, and over 100,000 signatories. The debate can be watched live on Parliament.tv. Please note that no Bill is being put forward and no vote on legislation will take place. We will win PR, just not quite as early as 30th October! Click here to read about how the debate was secured and lobby your MP to speak in favour of PR. Chippenham Debate: Is our electoral system fit for the 21st Century? Join Make Votes Matter Chippenham for this public debate on the state of British democracy! Is our First Past the Post voting system fit for purpose, or is Proportional Representation desperately needed? Plus a Conservative speaker... if we can find one who is willing to accept the challenge! With 68% of votes wasted in the last General Election and Parliament debating electoral reform on 30th October, this is a current and pressing issue. Join us on 26th October to get involved in the debate. Make Votes Matter - it's time for reform! Join us for this interactive, cross-party discussion about Proportional Representation followed by a drinks reception in London’s Living Room, with a spectacular view of the city as night falls. A contingent from Make Votes Matter will be in attendance in Manchester on Sunday. We'll be protesting the Conservative manifesto pledge to extend the use of the undemocratic First Past the Post voting system within the UK. We'll also be leafleting and speaking to all the other diverse groups and organisations represented at the demonstration to make sure people know that the underlying problem with British politics is our unrepresentative parliament. Join Issy at 11:30am on the side of Beaufort Street, next to the Roman Fort. Look for the MVM t-shirt! Labour Party Conference attendees are invited to join us for this special event, organised as a collaboration between the Joseph Rowntree Reform Trust, Make Votes Matter, Compass and the Labour Campaign for Electoral Reform. Make Votes Matter will be collaborating with Liberal Democrats for Electoral Reform and the Electoral Reform Society for events at this years Lib Dem Party Conference. Watch this space! Join us for this public rally outside Manchester Town Hall and hear from speakers including the former leader of the Green Party, Natalie Bennett, about how we can build a better democracy. This will be a fun event with the option to dress up and sing along with some reform songs! This weekend Make Votes Matter will be returning to the legendary trade unions summer gathering at the Tolpuddle Martyrs Festival. Last year the team joined local activists from MVM Dorset and held a stall in the marquee to talk to the many festival-goers and found many of them had a real appetite for reform - and many others were converted! Klina and Tim will be there with guest appearances from MVM Dorset who'll be leafleting at the event, and Mary Southcott from the Labour Campaign for Electoral Reform. Join us in the sun for some festival vibes and real democracy! For more info about the festival click here. Advanced ticket sales have closed but you will be able to buy tickets at the gate.